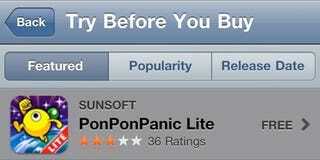 Apple has a new App Store category called Try Before You Buy, which features free lite versions of popular paid apps. Nice idea, but not good enough. Apple, we want a full 24-hour trial period on all apps. Instead of having lite flavors of paid apps to try, Apple should implement an App Store-wide 24-hour trial mode. Right now, not all apps have free lite versions and, some of those lite versions, are feature limited. This is a problem, because it limits the user when they want to explore what's in the marketplace. 2. From the moment you start it up, the timer will start. 3. At the end of the trial period, a menu would appear asking the user to pay for the application. 4. If the user accepts, the application will remain in the device. If not, it would be automatically deleted. This will also help the ratings of the apps: They could include the pay-through ratio in the algorithm to rate the apps, improving the ratings of applications that users choose to pay and keep. Consumers would be able to explore freely, as they won't need the app to have a lite version in order to try it. This will also decrease the reliance on the App Store ratings and critiques, which are often dumb, or could be skewed by artificial promotion. Is there any other better method to vote than with your dollars? Developers will have the opportunity to show their full app to every consumer without having to maintain separate lite versions of their apps. Apple will benefit from the consumer ability to explore any app, no matter if they have a lite version or not. This trial mode could only hurt one kind of application: The stupid ones. Those farty silly apps that have such a limited use that, after trying them for 5 minutes, you will never open them again. But if the app is good, people will keep it and everyone will be happier than now.